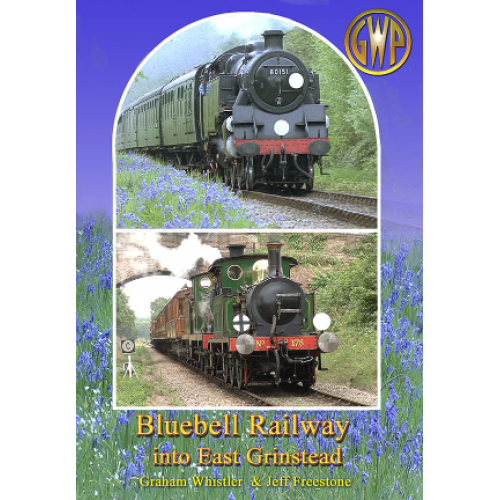 Filmed and edited by GWP with the full co-operation of the railway. Also available as a BluRay. Special thanks to Davis Allen who kindly provided us with some vital extra material. Another quality production from Graham Whistler Productions. It will be two years in March since the railway returned to East Grinstead and this DVD covers the reopening day (in some pretty atrocious weather) as well as the work involved in reconnection with the main line railway. The enormity of the reconnection task is covered in some detail and cannot be overstated – after BR closed the line not only was the track removed with almost indecent haste but one cutting was filled in with household rubbish. In all some 90,000 tons had to be removed and banks stabilised prior to track being replaced. The cost was astronomical and met largely through well orchestrated fund raising. The DVD shows several engines at work on this picturesque railway and several locations are used for different trains. Footage of the October 2015 Gala brings the DVD up to date with shots of Bittern running having used the mainline connection at East Grinstead to access the railway.